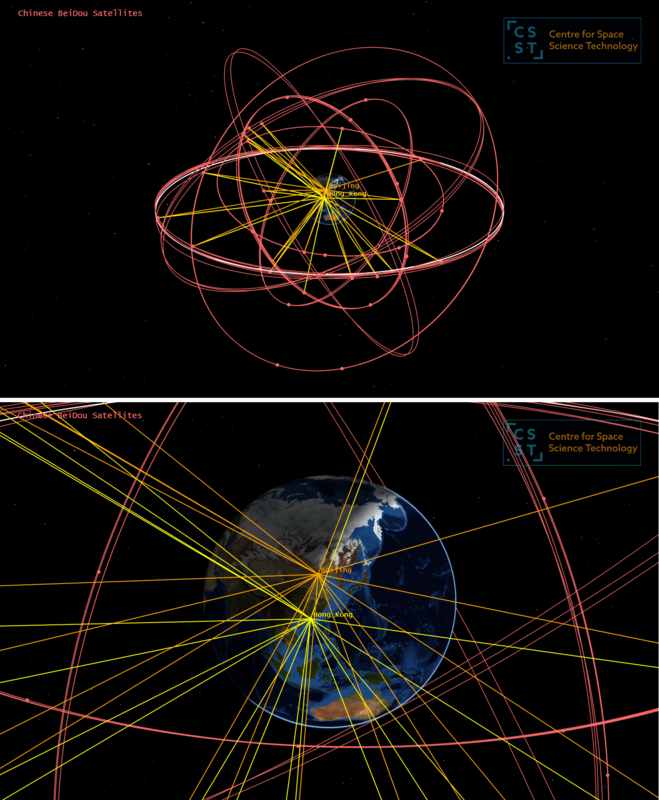 My previous post concerned the US Global Positioning System (GPS), which uses a constellation of at least 24 satellites (currently 31 operational) to provide worldwide high-precision positional location. This is the GNSS (Global Navigation Satellite System) that many of us use daily in our mobile electronic devices. There are other satellite fleets that have been assembled to deliver the same sort of service, however, and in the present blog post I will describe them. GPS was originally intended exclusively for the militaries of the US and its allies, but it is now more widely used. However, it is feasible for the US Government to degrade selectively the positional accuracy available, plus it is in theory possible to achieve a higher precision by using alternative technologies/orbits/numbers of satellites. Because of this other countries have developed their own GNSS capabilities, with those fielded by Russia, the European Union and the People’s Republic of China (PRC) being the most notable. The orbits used in those three systems are discussed here. The Russian GNSS is called GLONASS, which is an acronym derived from the Russian term specifically meaning ‘Global Navigation Satellite System’. All four GNSS fleets use satellites in Medium Earth Orbit (MEO), but not quite the same altitudes/orbit sizes. The US GPS satellites fly at a height about 20,186 km above the equator, taking 718 minutes (half a sidereal day) to complete a circuit of the planet; the GLONASS satellites fly slightly lower, at around 19,130 km, and consequently take only about 675 minutes to finish an orbit. Another distinction is that instead of being arranged in six orbital planes tilted at 55 degrees to the equator (as with GPS), GLONASS uses only three orbital planes inclined by 64.8 degrees. This larger angle provides for better coverage at high latitudes, as needed by Russia (at least in the northern hemisphere). As was the case with GPS, GLONASS was originally an exclusively-military system but the signals are now available for civilian usage by anyone; the constellation is also now operated by Roscosmos (the Russian Space Agency). The current fleet of second-generation GLONASS satellites became fully-operational in 2011, providing positional accuracy to a best value of about 3 metres (although often somewhat poorer), with global coverage. These are called the GLONASS-M satellites; there have been several completed satellites kept in storage awaiting deployment as needed. The third generation, termed GLONASS-K, is already being launched, and is expected to take over the service within the next few years. 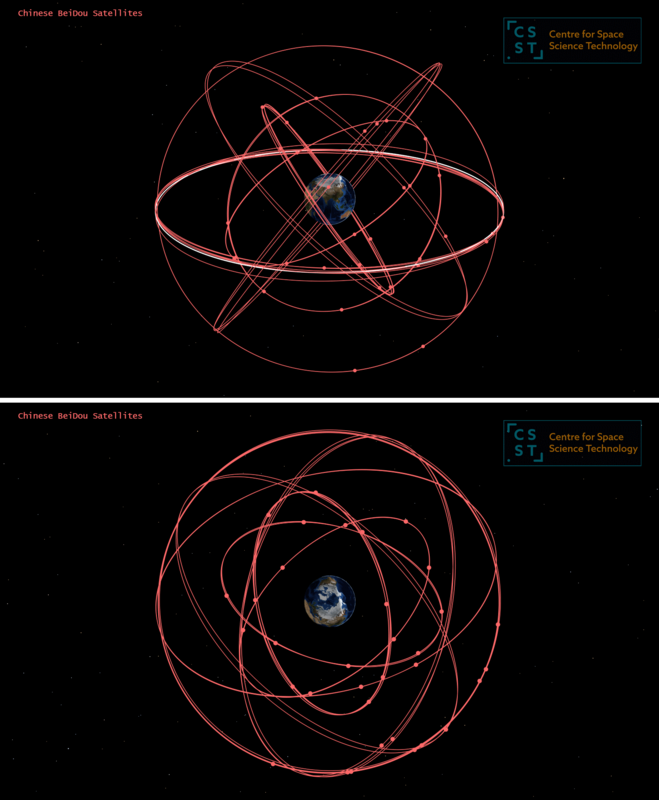 There are 24 satellites depicted in the diagram below; 23 are GLONASS-M with one GLONASS-K (Cosmos-2501) currently contributing. This third generation has lower mass, greater positional accuracy, and longer expected lifetimes than the constellation now being phased out. 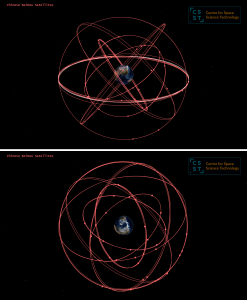 Sideways and pole-downwards views of the current GLONASS navigation satellite constellation, 24 satellites being deployed in three orbital planes tilted by almost 65 degrees to the equator. Top panel: Line-of-sight (more than 15 degrees above the horizon) connections between Moscow (six satellites) and Vladivostok (seven satellites) with members of the GLONASS constellation at the start of 2019 January 24. Lower panel: A close-up for clarity. 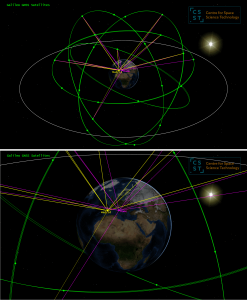 Two cities in Russian territory were chosen in this example, but GLONASS renders global positional measurements and some commercial GNSS receivers employ the signals from these Russian satellites in addition to those from the American GPS satellites in order to improve precision and decrease the waiting time for available satellite signals. A movie available here shows the motion of the GLONASS constellation over twelve hours (actually in the future! — on February 9th). It is 28 seconds long; 18 MB WMV file. The GNSS constellation currently being deployed by the European Union (EU) is called Galileo. The service is operated by an organisation established specifically for this purpose, the GSA (Global navigation Satellite systems Agency), with its headquarters in Prague. The Galileo system is largely a response from the EU to the recognition that both GPS and GLONASS have military heritages, and might be either downgraded or perhaps encrypted by the US or Russia at any time (i.e. Selective Availability); Galileo therefore makes the EU independent with regard to satellite navigational capabilities. The first launches of the operational fleet occurred in 2011, and so far there are 24 satellites in orbit out of the overall 30 that will comprise the completed network, although two of those (launched together in 2014) were placed in the wrong orbit and are currently under testing. Four of the 22 in the ‘correct’ orbits were launched only last July, and are still undergoing commissioning. There were precursor launches from 2005 for testing purposes. The plan is for there eventually to be 24 fully-operational satellites arranged in three orbital planes, with six on-orbit spares available. Early operational capability (EOC) was announced at the end of 2016, and full operational capability (FOC) is planned for later this year. The constellation will then be subject to rolling replacements with updated satellites, the complete fleet being renewed from 2025. The Galileo satellites are again in MEO, but at altitudes distinct from both the GPS and GLONASS orbits. Their altitudes are about 23,225 km above the equator, resulting in an orbital period of about 845 minutes. The inclination of the orbital planes is nominally 56 degrees. 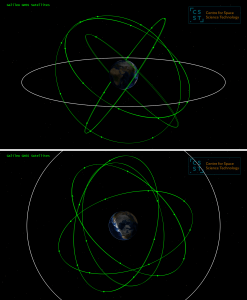 Sideways and pole-downwards views of the 24 Galileo navigation satellites presently on-orbit. The complete constellation will number at least 30, deployed in three orbital planes tilted by about 56 degrees to the equator. Two of the current 24 were inserted into the wrong orbit, which is why a fourth plane appears above. Top panel: Lines-of-sight from Madrid and Rome to Galileo satellites at least 15 degrees above the horizon as at the start of January 24th. There are nine possible connections for Madrid, and ten for Rome. Bottom panel: a close-up for clarity. Although here two European cities were chosen for display, in principle Galileo will deliver position and timing information globally. A movie available here shows the motion of the Galileo constellation over twenty hours on January 31st. It is 33 seconds long; 21 MB WMV file. Apart from the Galileo satellites in MEO, another set of satellites is used to aid in the positional accuracy that Galileo (and other GNSSs including GPS, GLONASS and BeiDou) can deliver. Currently three satellites in geostationary orbit comprise the European Geostationary Navigation Overlay Service (EGNOS). Such an overlay is termed a Satellite-Based Augmentation System (SBAS), and apart from EGNOS there are also SBAS constellations operated by the US, Japan and India, each of which covers their local region. The effect of an SBAS is that the precision delivered by a GNSS can be improved to become around one metre. There is no such system for New Zealand, Australia or the Pacific. The BeiDou Navigation Satellite System was initiated in 2000, and since then the first satellites have been replaced from 2011 by a second generation known as BeiDou-2 (formerly COMPASS). Now a third generation known as BeiDou-3 is being gradually built up. BeiDou is the Chinese name for the constellation of stars known as Ursa Major, or the Big Dipper. 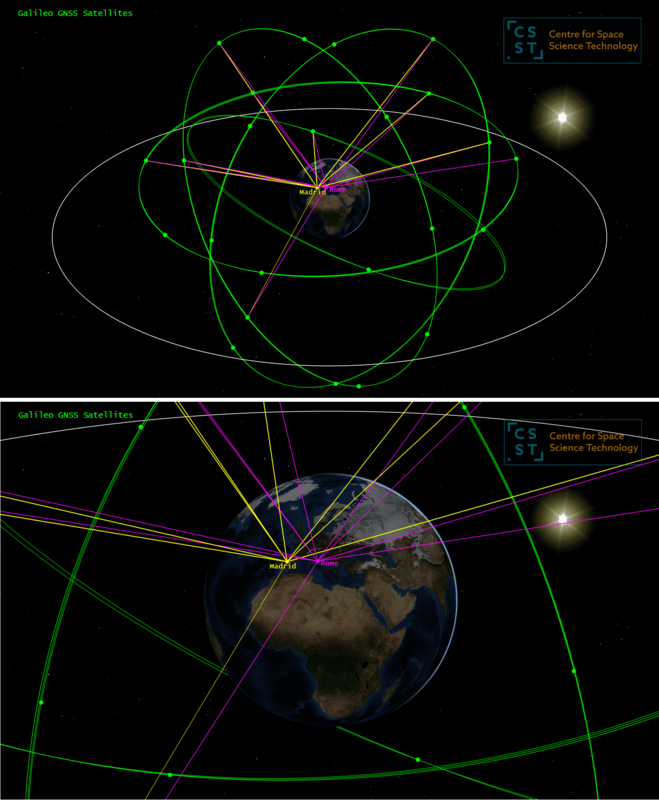 Overall the system consists of 34 satellites at present, with another six undergoing testing/commissioning on-orbit. The majority – twenty-two of them – are in MEO, but the constellation also includes five in geostationary orbit (GEO) and seven in inclined geosynchronous orbits (IGSO – orbital period one sidereal day but not above the equator). 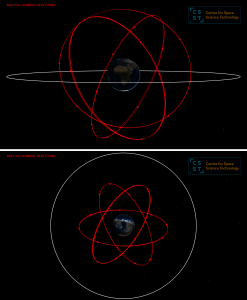 Both the MEO and the IGSO satellites are arranged in three planes, and nominally tilted by about 55 degrees to the equator; the larger IGSO paths lead to perturbations by the Moon and Sun being more severe, causing some wander, and so the inclinations of these range between 52 and 59 degrees. 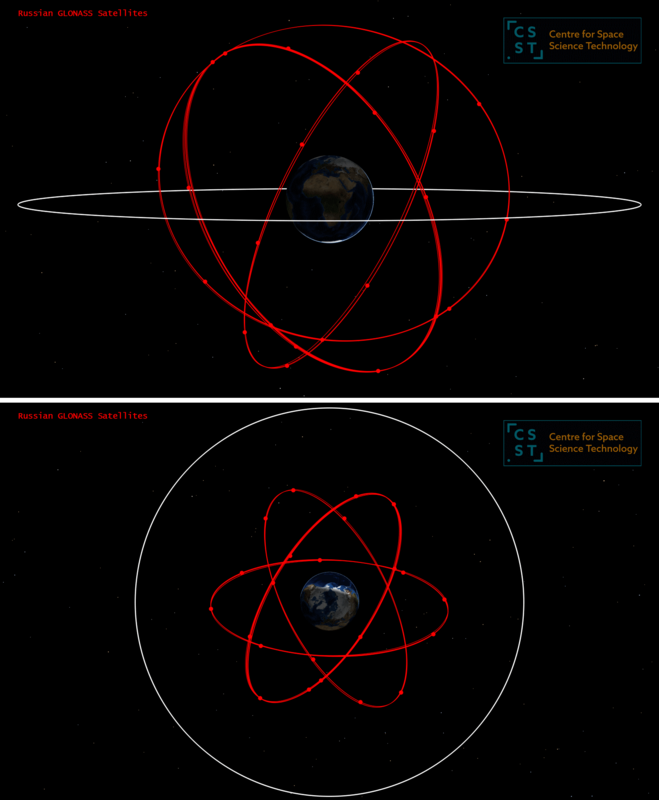 The orbital period of the MEO satellites is near to 773 minutes, and they fly about 21,530 above the equator (i.e. below Galileo, but above the GPS and GLONASS MEOs). 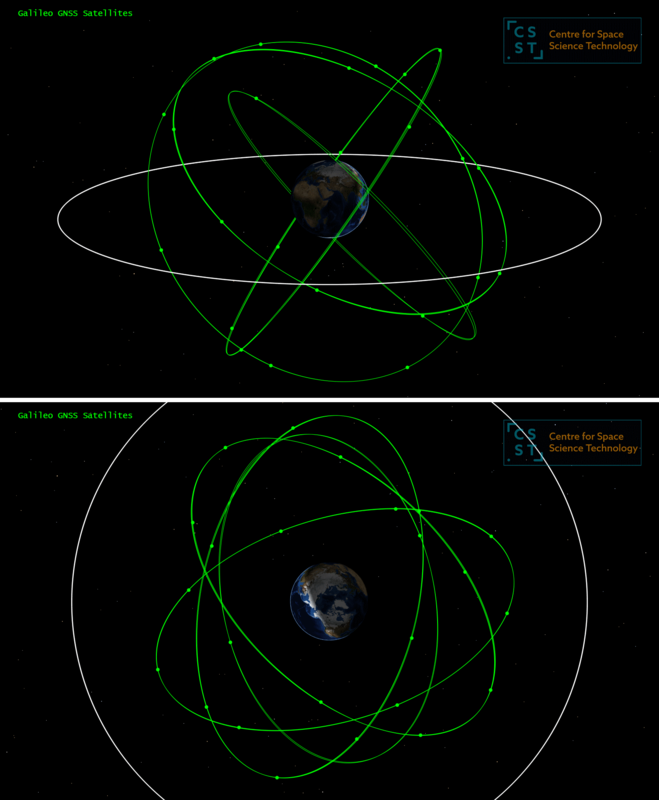 The BeiDou GNSS is therefore a mix of orbits, as shown below. It is claimed that the timing and positional accuracy it can deliver is better than the other three systems mentioned: about ten metres for the free low-precision system, but as good as 10 cm using coded signals available to the Chinese military. 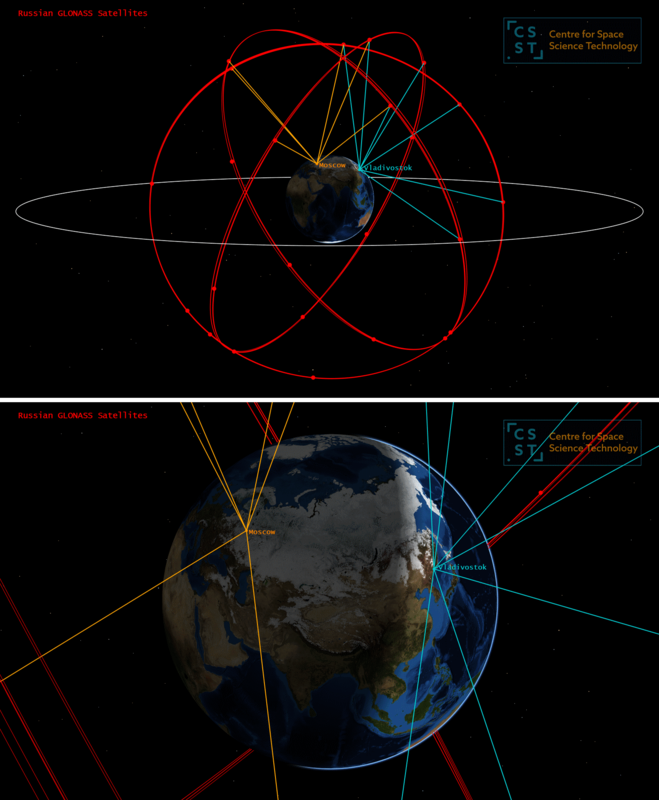 Sideways and pole-downwards views of the 34 BeiDou navigation satellites presently operational, a mix of second- and third-generation vehicles. Another six BeiDou-3 satellites are already on-orbit and undergoing commissioning. Top panel: Lines-of-sight more than 15 degrees above the horizon from Beijing and Hong Kong to the BeiDou operational satellites as at the start of January 24th. Each exhibit 18 available links at that time. Lower panel: a close-up for clarity. 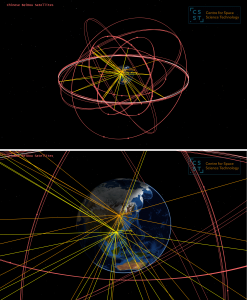 Although other GNSS constellations such as GPS, GLONASS and Galileo render essentially the same positional precision globally (if one ignores the regional improvements made possible by means of SBAS services), the BeiDou system is optimised for the Asia region; this is not really a fair comparison, however, because in essence BeiDou includes its own SBAS satellites (note the longitudes of the geostationary BeiDou satellites in the above diagrams). A movie available here shows the motion of the BeiDou constellation over twenty-four hours (February 12th). It is about 57 seconds long; 35 MB WMV file. This blog series about satellites is intended to be rudimentary in nature and hopefully of educational use. Feel free to link from your own web pages.